Coventry Courier Offers Cheap Parcel Delivery On Standard Or Oversized Packages. Overnight Or Same Day Courier Services Available. We’re a Coventry Courier with the ability to deal with your Next Day UK & International Parcels (see below for our same day courier & pallet delivery services). We have long provided a fully National and International Low Cost Collection and Delivery Service to customers in all areas of the UK. Along with customers being able to drop parcels at Post Offices & ParcelForce Depots, we also provide a convenient large, bulky or awkward parcel drop-off point for customers in: Coventry, Nuneaton, Bedworth, Exhall, Balsall Common, Kenilworth, Berkswell and Meriden at our Coventry Distribution Centre on Grovelands Industrial Estate, Longford Road, Coventry. Why not take advantage of our cheapest parcel delivery rates and call us today for more information? In addition to businesses and members of the public taking advantage of our comprehensive parcel service, other Coventry Couriers are finding our low cost next day service is suitable for their non same day deliveries as well. U.K. & International Pallet Distribution Services. Same day pallet delivery or overnight pallet distribution to Coventry or most other U.K. mainland destinations. Single or bulk pallet movements handled. Short term & long term warehousing, pallet storage available. 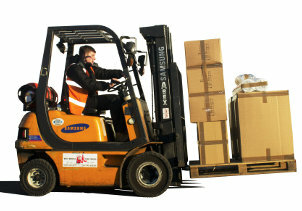 UK & International Pallet Delivery / Distribution – local Coventry pallet delivery starting from just £19.90 + vat. Big Savings on shipping single pallets and bulk pallet delivery to all other areas of the UK. Maximum discounts applied to pallets shipped from or into any of the following Coventry post codes CV1 CV2 CV3 CV4 CV5 CV6 CV7 CV8 CV10 CV11 CV12 CV21 CV22 CV23 CV31 CV32 CV33 CV34 CV37 CV47. However, highly competitive rates are offered for all other U.K. Post Codes. Urgent Same-day Delivery Needs? DEFENDA COVENTRY SAME DAY COURIERS are a Coventry courier & transport company that provides a Nationwide & a Local Coventry Sameday Courier Service and Pallet Distribution Service throughout the UK & continental Europe. Whatever you need delivering…from parcels to same day delivery of pallets, we can help you achieve pressing deadlines with one of our dedicated vehicles. Low prices will ensure that even these urgent deliveries can be carried out at highly competitive rates without damaging your bottom line. As a Coventry based same day courier company we provide a reliable, fast and very cost effective service to customers throughout the UK, Europe and the rest of the world. If you are looking for Coventry Couriers to provide an unrivalled level of service call us on Coventry 024 76466000 to discuss your requirements. Urgent Sameday document delivery service available. Our storage & warehousing is centred around Coventry, Exhall, Bedworth & Nuneaton but our same day courier services & heavy goods road transport is available nationwide, across Europe and the rest of the world when required.